Wow, it's honestly been so long since I've made a blog post that I forgot how to go about entering the data into our website management system! 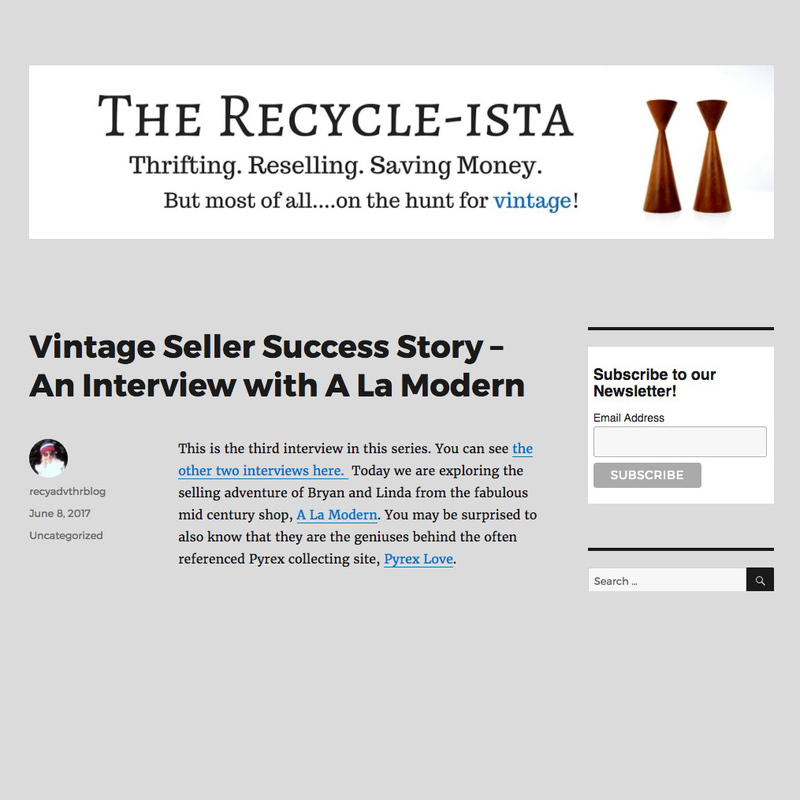 In any case, a bit of good press came in today in the form of a short interview with Shannon over on The Recycleista. 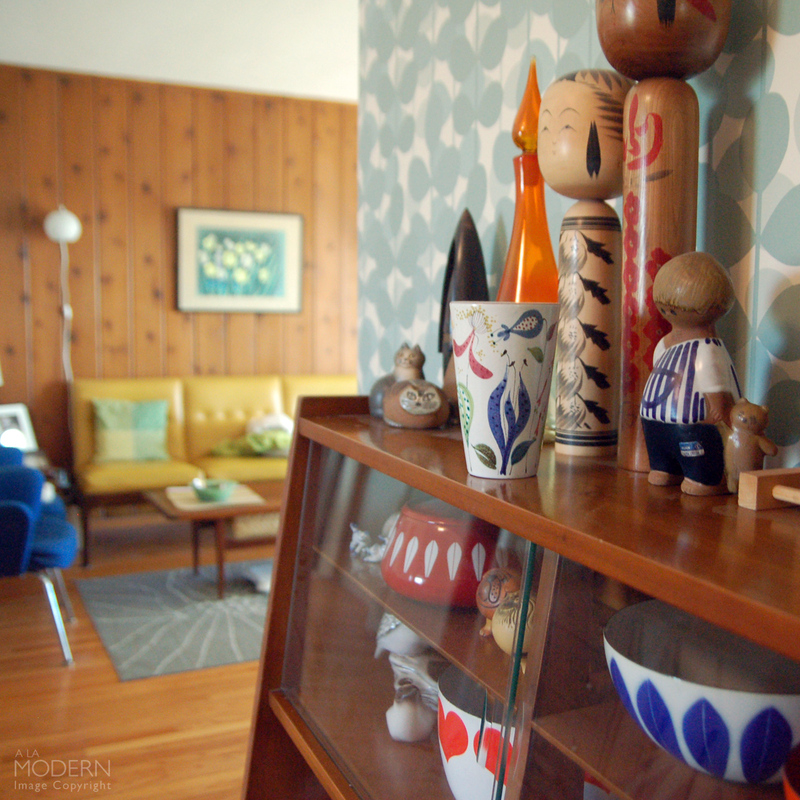 We had a chance to answer some questions for her "Vintage Seller Success Story" series. This was an honor because there are a ton of other vintage shops that have had more success than we have. But it was fun to reminisce about the origins of our selling adventures - it's been 8 years now since we started and so much has changed. 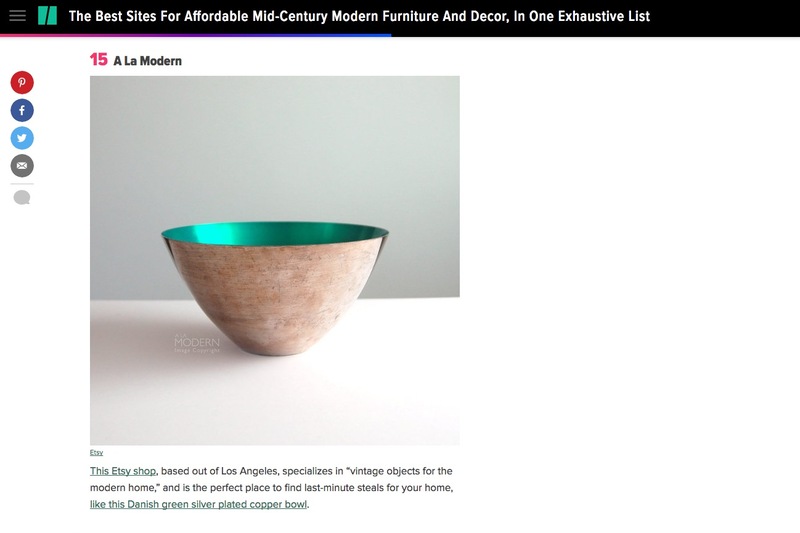 Hopefully, we'll have a few more blog posts about vintage selling before the year is up. Going to run a quick roundup before I head out to look for more goodies. Over the last couple years, thrifting for inventory has taking a nosedive - so I've been supplementing it with some other methods, both online and off. 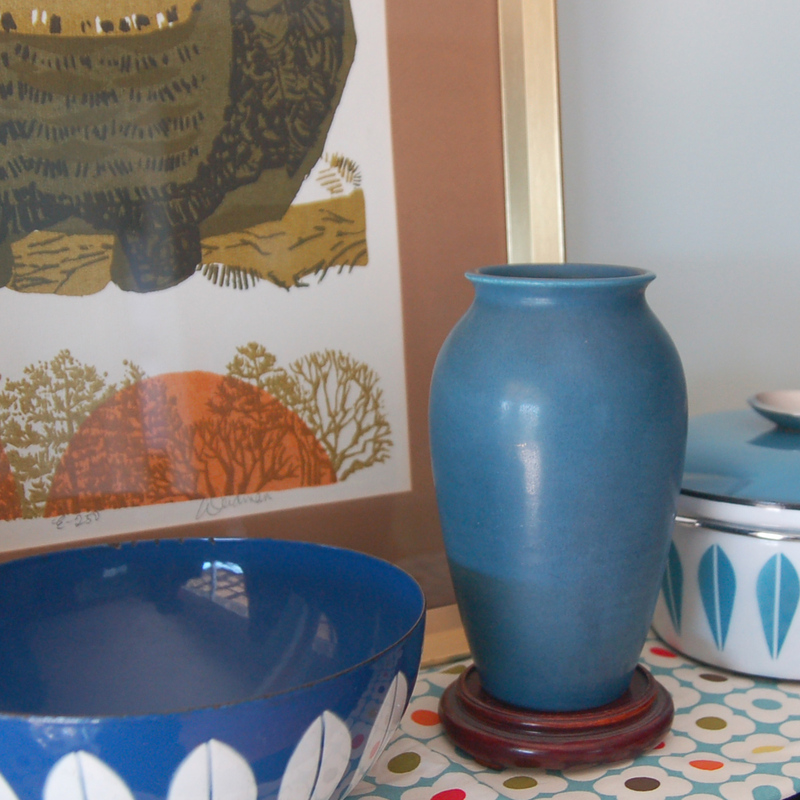 You can still find amazing things at thrift stores, but it's just a lot more work. I still like it better than the estate sale grind (although I should probably step up my game on those). 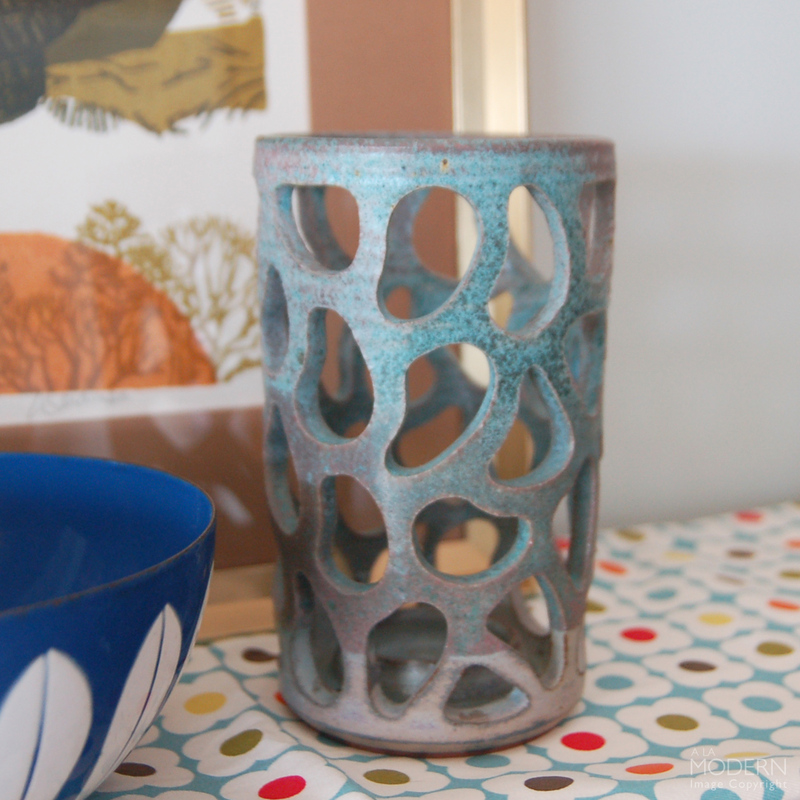 I wasn't really familiar with ceramics by John Novy but was delighted to find this unusual candle holder at the thrift. Fully marked on the bottom, so I can only imagine it had just been put out. From what I've read, Novy was a ceramicist in San Diego, although he was born in Austria. He was also a member of the San Diego Potters Guild and part of that legendary Allied Craftsmen group in the 1960s-70s. 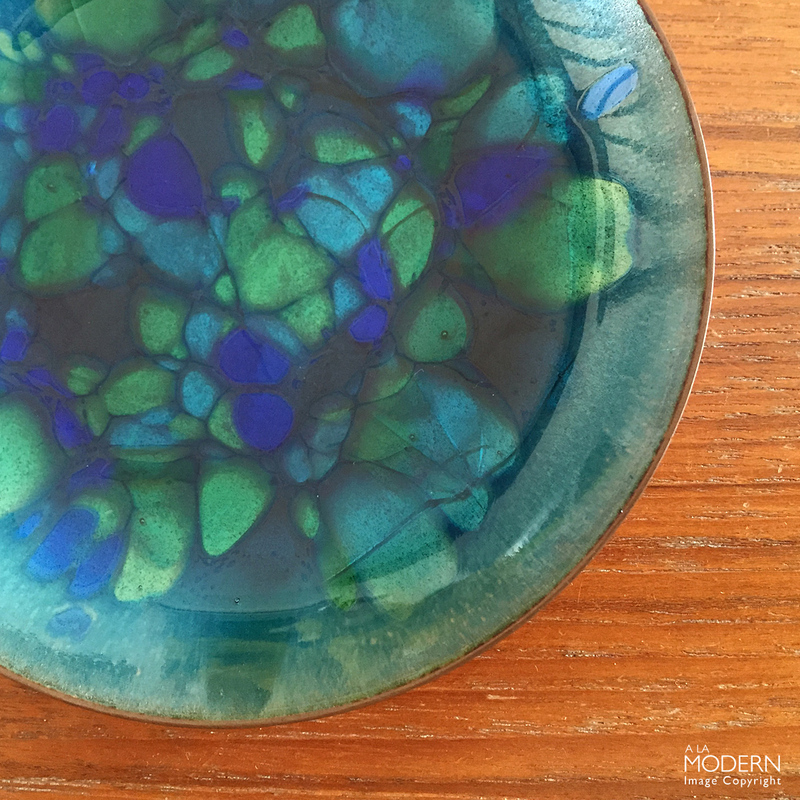 We've had this Win Ng enamel dish for quite a few years, along with another larger shallow bowl. You probably know Win Ng from the Taylor and Ng brand and store, but he also did a lot of studio work in ceramics and enamel. We originally knew of him through the "naughty" animal series of mugs that we used to find all of the time - I think we had a very early blog post on those mugs. It's still possible to find these enamels unidentified every so often, along with pieces by Jade Snow Wong, because the sig on the back is often very hard to read if you don't know what you're looking at. 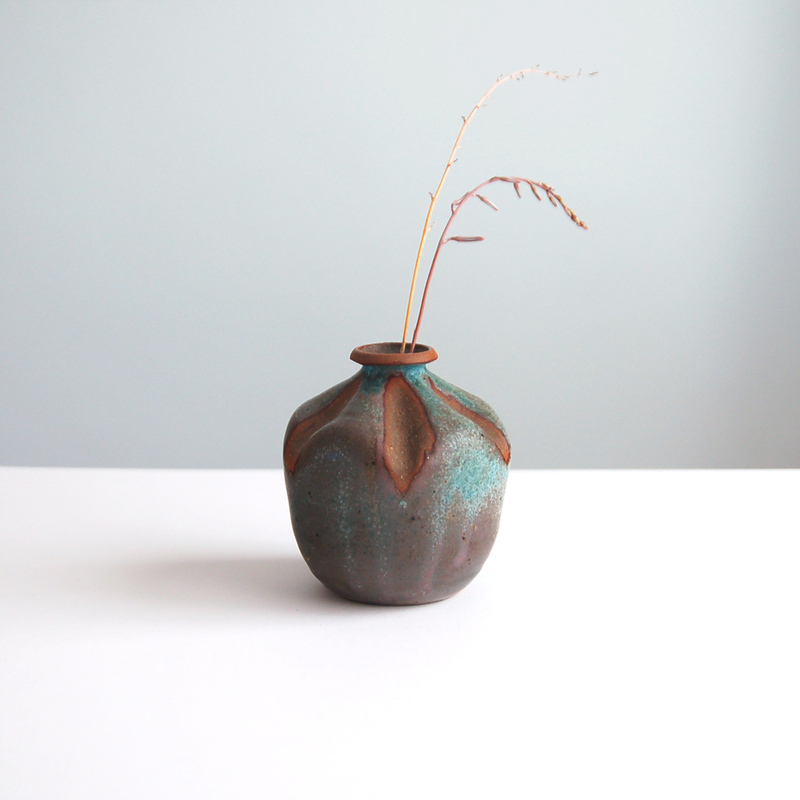 I'd thought this piece might be more modern on first glance, but it turned out to be a Rookwood Pottery vase from 1924! It has a simple shape which almost made me pass it by, I thought it might be German or Japanese from the 1980s even. But it's fully marked on bottom with the Rookwood stamp and "586C". It's still always a shock to find very old art pottery like this in a thrift. Over the last 10 years, we've found a number of rather amazing pieces that are either unmarked or just not identified. Granted, a year or two might go by where we don't thrift a single piece, but it's still crazy what slips through. 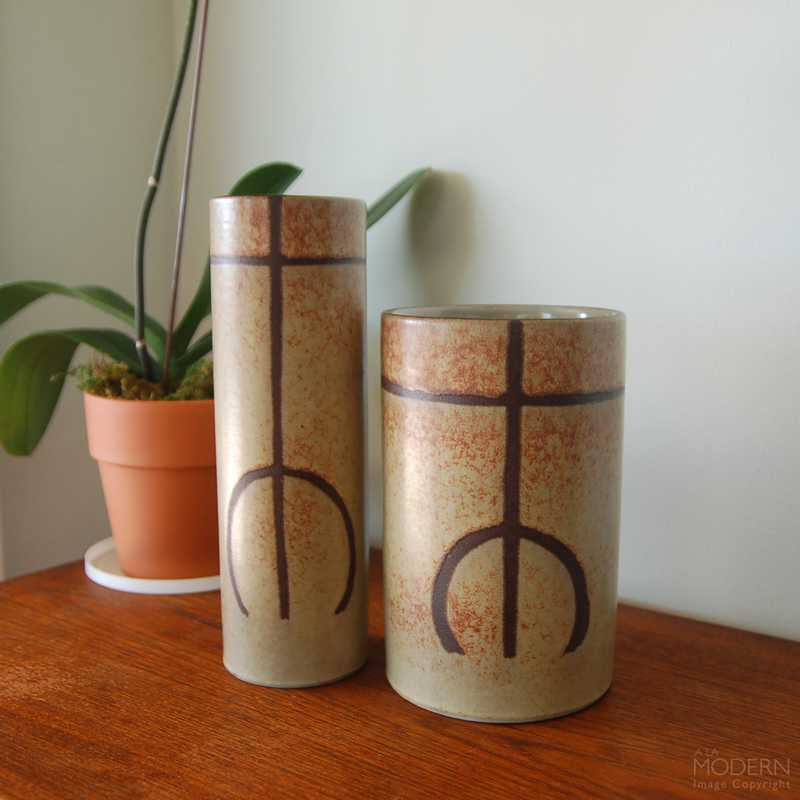 These Alvino Bagni for Raymor primitive style cylinder vases were a pick up from an estate that I went to very late. At the time, I didn't know what they were since they didn't have any marks at all - apparently, the other pickers didn't know either because they were still there. But the price was right, and after some lucky googling I figured out that they were Bagni. Saved the most interesting find for last - I'd heard of these alleged Edith Heath studio vases when we first started collecting California pottery. It was actually from reading Jack Chipman's Scrapbook that I was aware of these curious items with pink or blue speckles and darker brown glaze on top that were incised "Heath" on the bottom. Several years ago, our friends Bit of Butter had come across one in real life, and it seemed like the consensus was that it was indeed done by Edith Heath. So when I saw this one, I had to pick it up even though the price was a bit high. Chipman's book states that he's uncertain they are indeed by Edith Heath / Heath Ceramics. They came in several different shapes (all vases and bowls as far as I know), and all seem to have the mysterious incised Heath name on bottom. I haven't tried to contact Heath yet to confirm, but it seems like most people are saying that it is indeed by them. I have to say - after handling it in person, I would have had some doubts if so many other people hadn't already said it was by Heath. The ceramic is actually white, which is different than the usual brown clay you see on Heath. The brown accent glaze does seem to be correct for Heath. But it is very lightweight for a studio piece, and I don't think I could feel any "finger rings" on the inside which would indicate it was made on something like a potter's wheel. 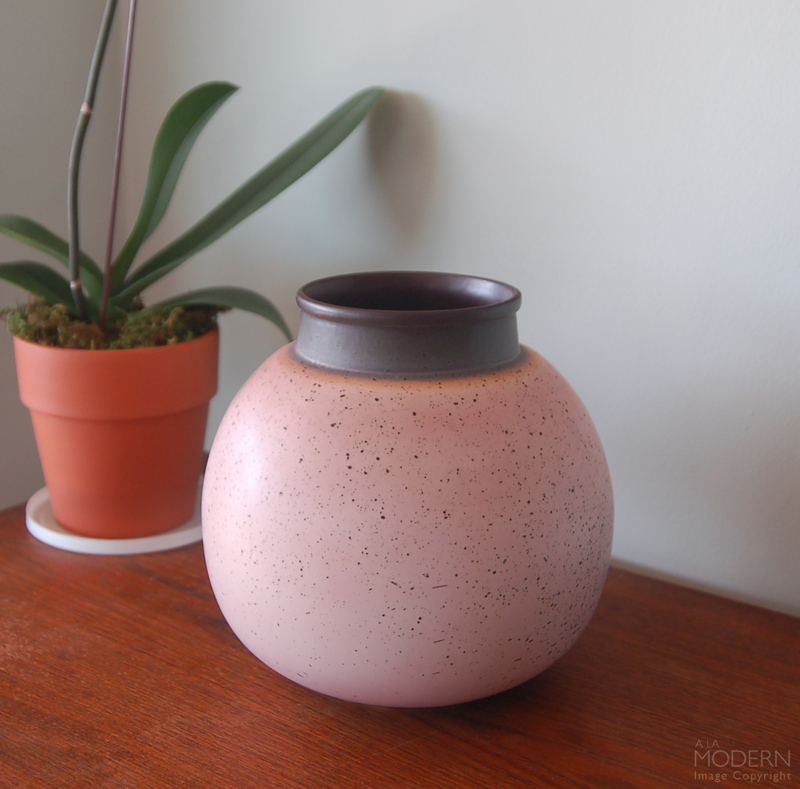 There are also a number of other California potteries that made production pieces with this type of speckled glaze. I actually was combing over the piece trying to see if there was a "cast" line which might indicate it was production and not studio ware. I didn't find one so far. I had this theory at one point that maybe these were Heath Ceramic pieces, but they were hand finished cast pieces that never went into full production. I sort of doubt this is the case any more, but who knows. In any case, we're still thrilled to have one of these pieces. I'd be curious if anyone has any concrete proof it was by Heath - the best would be if someone had some magical literature that showed them. Well, I figured I should get a post in before February comes to an end. I was supposed to start blogging on a regular basis after our site re-code, but it's quickly devolved into a chore. I kept putting it off every week until today. With the other aspects of the "business" taking up time (including taxes this month), I'm running into that same trap of trying to justify making posts. So I'm just going to show some pretty pics we already posted on instagram. But this discontent will be revisited soon. Of course, the majority of product shots are still taken against a white background. I looks cleaner, I know - but I'm going to be including both types for listings. Having a non-white background also seems to help with the overall lighting in some shots, and we've switched back to using our old Nikon DLSR for many product photos. By the way, the weedpot above is marked "Cohn" on the bottom - I thought that was Abe Cohn at first, but the sig didn't match up with any that I've seen. 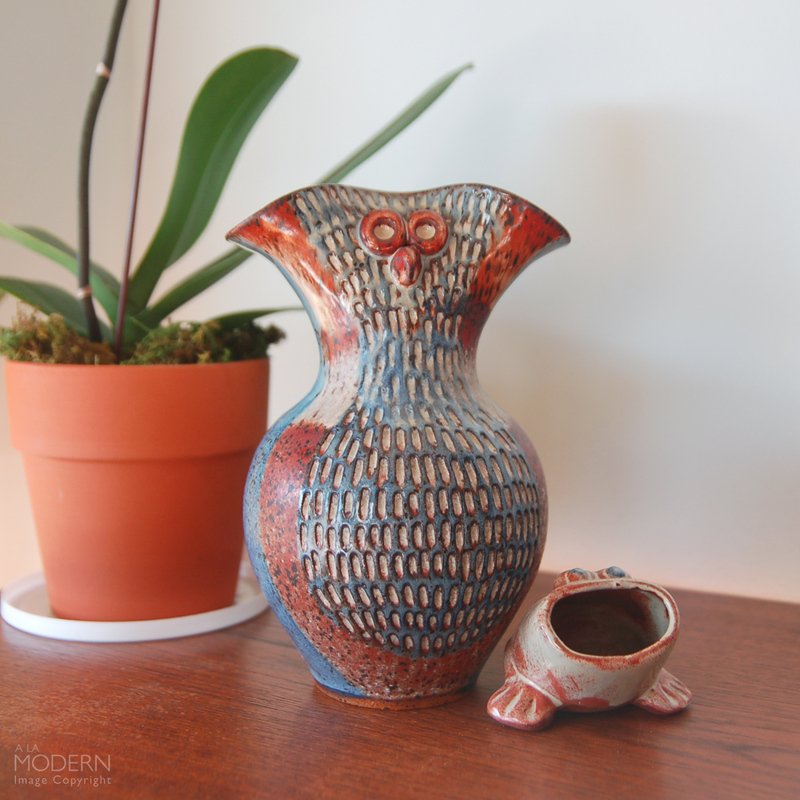 Picked up this large studio pottery David Stewart owl/bird vase at an auction. The frog is also a studio piece that has been in our collection. We've been keeping a lot of our DS Lion's Valley, especially if it's the studio stuff. But I've been considering liquidating a lot of it at some point. 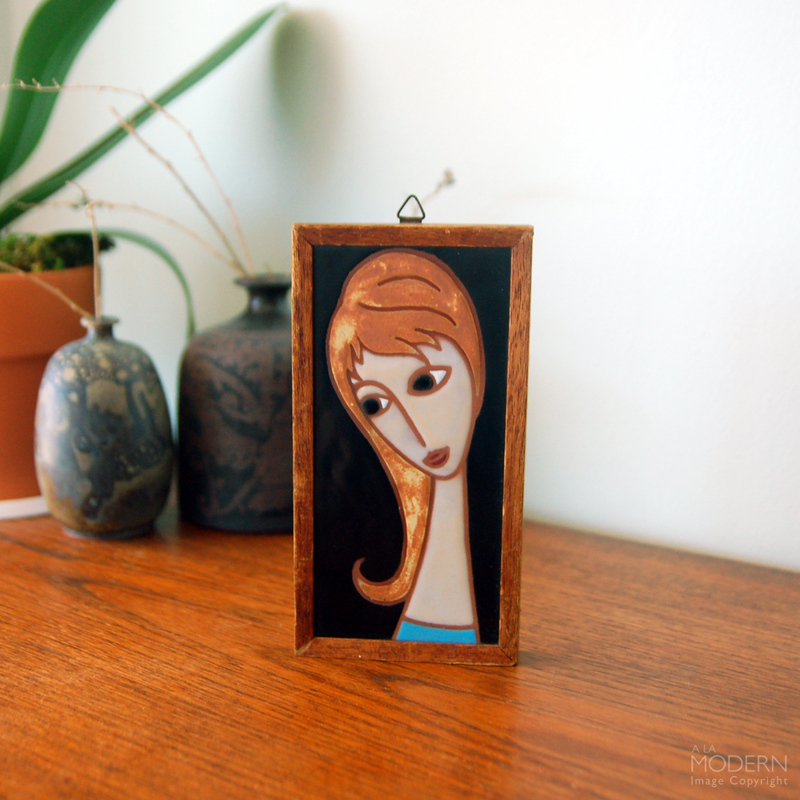 This is a small tile plaque by Greek artist Helen Michaelides that we were happy to pick up. I really like this one, it's a little different than some of the other stylized ones we've seen. Very close in feel to the Panos Valsamakis tile wall hanging we've had - and possibly she could be a contemporary or student of his. But there's very little info on the artist - we learned all of it from our friend Mid Mod Mom who figured out what that "Mixandidou" signature was awhile back. If anyone knows anything additional about the artist, please post a comment about it below. 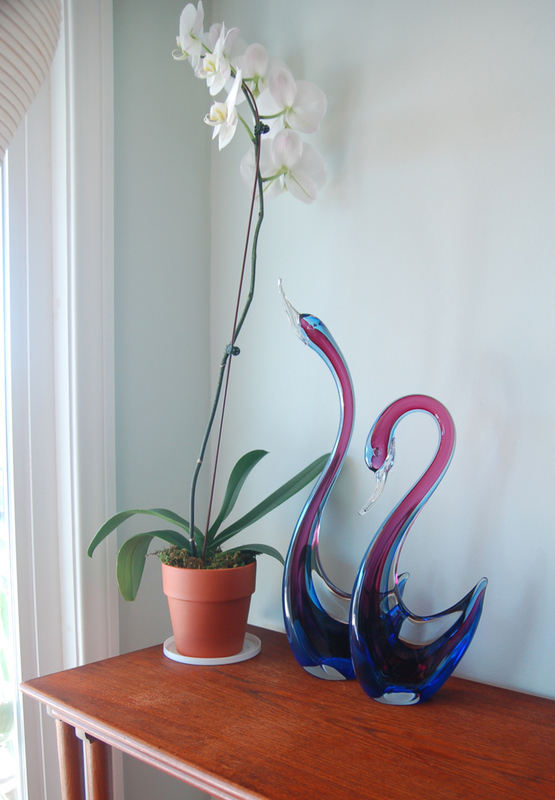 Ending with a set of beautiful Murano sommerso glass swan figures, likely Flavio Poli pieces. Glass is a neverending learning experience for us - but we've gotten better over time. In this new super competitive world of picking and thrifting where knowledge is a Google away, it's really important to learn more about potentially valuable items that are unmarked. P.S. it looks like our custom contact forms are working out, so we should be getting all our messages now.